This idea followed me everywhere in Mexico City, wisdom imparted by the man who gave us a moving tour of Luis Barragán’s Casa Gilardi. The duality of light and its absence and the moving nature of being in-between is how I’ll remember everything from this trip—the architecture, the foliage, the way afternoon sun fell dappled upon the sidewalks—but especially the experience of walking into Xinú. Find the discreet entrance in Polanco, walk through a dark foyer and up a flight of stairs until you emerge in the showroom, like being birthed into an olfactory dream. 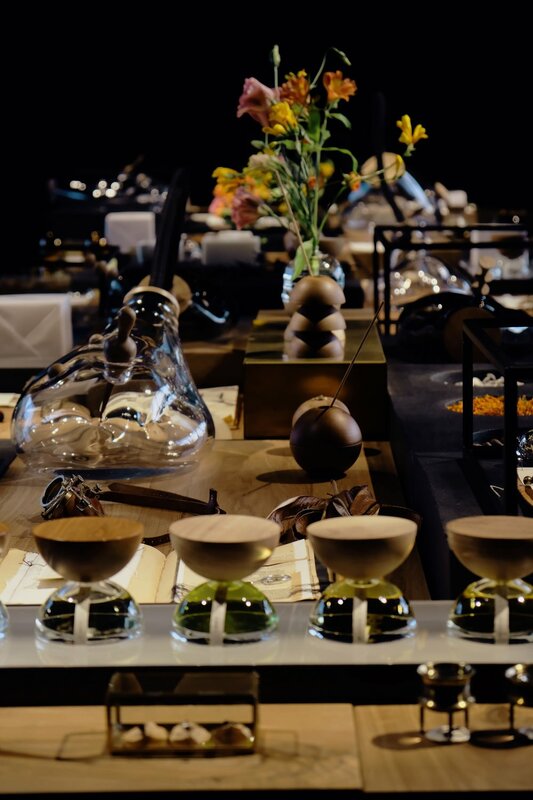 The atelier itself is a dark, open room flanked by two bright gardens, cinematically lit to draw the eye to the vast display of raw materials, olfactive devices and perfumes at its centre. The name means “nose” in Otomi, a tonal indigenous language still present in parts of Mexico. In their own words, Xinú “draws its inspiration from The America’s aromatic botany, its perfumes document and pay homage to the visual and olfactory richness of the continent's species.” What you see on the table, they explained, represents the artefacts of a lover of nature—someone who is always searching, discovering, and collecting. The collection features five perfumes by Givaudan’s Rodrigo Flores-Roux, the only formally trained perfumer from Latin America. (I had not heard of him before this trip; turns out his olfactive signature can be found on more mass-market but equally enjoyable compositions like Clinique Happy and Tom Ford Neroli Portofino.) The formulas are elegant, almost baroque—bringing to the forefront regional materials like agave, copal, marigold and Mexican tuberose, which the company also showcase in their gardens. Xinú’s story is one of craftsmanship, artistry and botanical tradition, but interwoven throughout is a narrative of sustainability. The brand supports responsible sourcing when it comes its raw materials, and the same longevity is intended for their packaging. 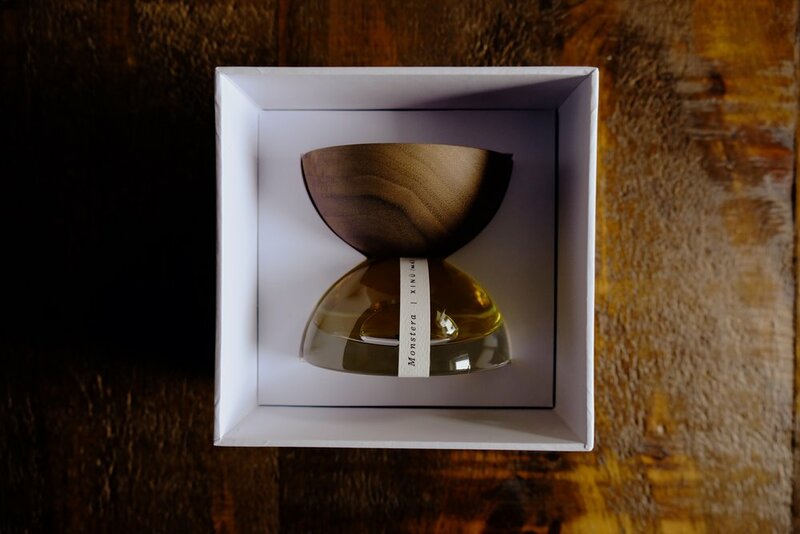 The beautiful bottles (designed by Esrawe + Cadena) are made with certified walnut—for every tree used, twelve are planted—and glass hand-blown in Mexico City. Designed to be repurposed after the perfume is used up, the two hemispheres reconfigure to form vases and incense holders. Don’t know about you, but I love a two-in-one situation. My souvenir of choice is olfactive: when I’m traveling, I always like to bring home a perfume that reminds me of the place. Like Parfum Satori in Tokyo, and Gaglewski in Grasse. For a city abound with greenery, I chose Monstera, a juicy green composition that centers on the monstera plant—both leaves and fruit, which gives the scent a pineapple-y top note—as well as the white datura and bullhorn orchid. It smells like a jungle, ripe and damp, somewhere you leave your heart.